HA NOI (VNS)— Tens of thousands of books can be viewed by readers at the Ha Noi Book Fair which opened yesterday at the Royal Citadel Heritage site. The event, running until October 2, aims to improve citizens' reading habits and focuses particularly on young readers. Located at Van Mieu (Temple of Literature) and Quoc Tu Giam, Viet Nam's first university, the event capitalises on the city's literary history. Khue Van Cac (Constellation of Literature Pavilion), a symbol of the Vietnamese people's fondness for reading, was made out of books for the event. 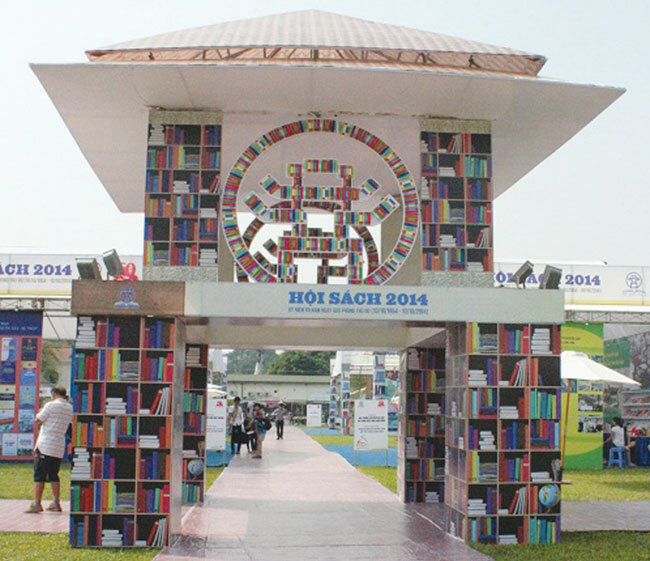 Forty five publishing houses from across the country occupy 112 booths with their latest publications including children's books, works by Vietnamese authors and translations at discounted prices. The book fair hosts seven book exhibitions, each with unique themes - Ha Noi's past and present, late President Ho Chi Minh in Ha Noi and some beautifully designed publications. Lectures with answer and question periods will be given throughout the festival. Well-known authors such as Do Phan, poet Vu Quan Phuong, 95-year-old cultural researcher Huu Ngoc and historian professor Phan Huy Le, who penned Lich Su Thang Long – Ha Noi (History of Thang Long – Ha Noi) - will participate. During the week-long event there will also be a slew of book-related arts-and-crafts activities, including a calligraphy performance and a bookmark decoration event. The festival also hopes to improve reading habits. Donated books will be distributed to local libraries, schools, post offices and cultural houses in poor communes in Ha Noi, Truong Sa (Spratly) island district and Khanh Hoa Province.